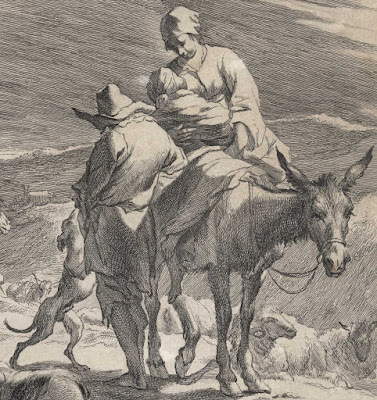 “Mother with a Child on a Donkey”, 1657–58, after a drawing by Nicolaes Berchem (aka Nicolaes Pietersz. Berchem; Nicolaes Berchen; Niclas Berghem; Nicolaes Pietersz. 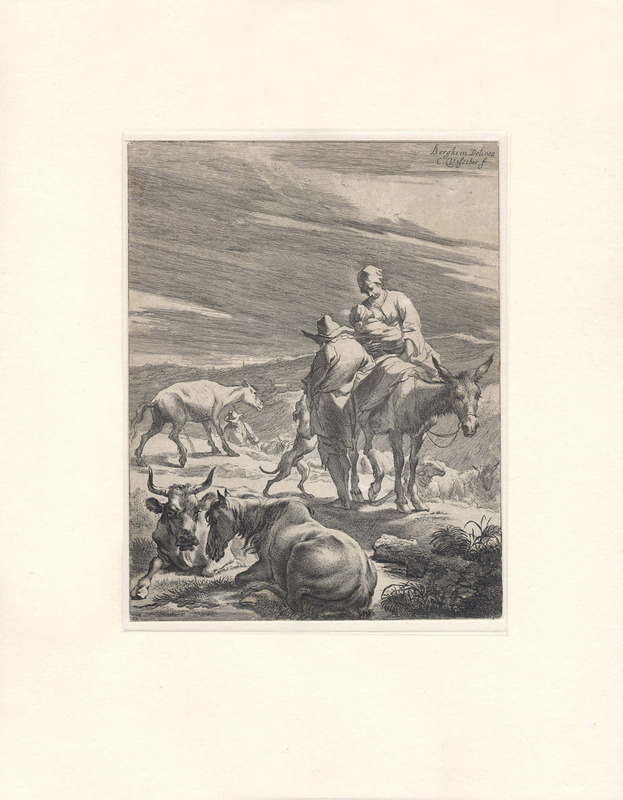 Berrighem; Claes Berighem) (1621/22–83), plate 4 from the series of four plates, “Landscapes after Nicolaes Berchem” (Hollstein 68–71). 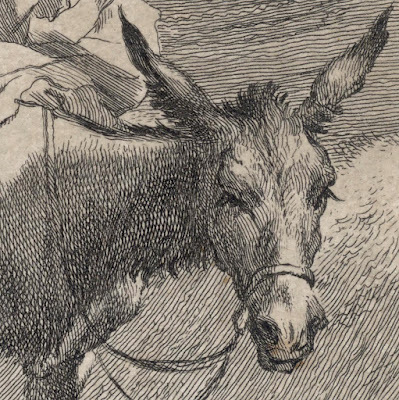 Engraving with etching on laid paper trimmed along the image borderline and re-margined on a support sheet. Inscribed on plate within the image borderline: (upper right) "CBerghem Delinea. 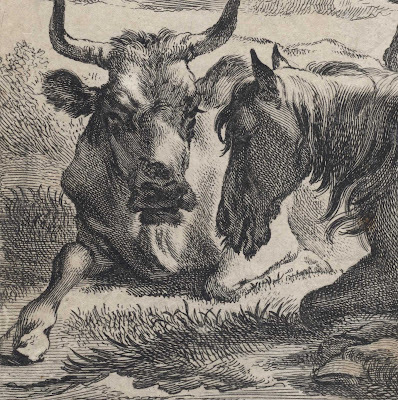 / C. Visscher f."
Hollstein Dutch 71-2 (2) (F W H Hollstein 1949, “Dutch and Flemish etchings, engravings and woodcuts c.1450–1700”, Amsterdam). Condition: crisp impression trimmed along the image borderline and re-margined on a support sheet. The sheet is in a good condition (i.e. there are no tears, holes, folds or foxing), but there are several spots of restorations (virtually invisible), a few pale stains around the edges and general mellow toning appropriate for the age of the print. I am selling this simply magnificent and relatively large engraving for AU$310 (currently US$251.46/EUR201.87/GBP177.57 at the time of posting this listing). Postage for this print is extra and will be the actual/true cost of shipping. 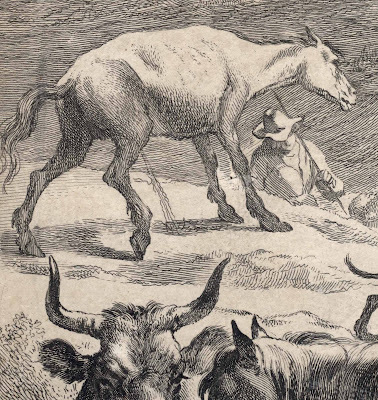 If you are interested in acquiring this often reproduced/famous print that is full of action from everyday rural life in the Dutch Golden Age—note the peeing horse on the left; the bull and horse discussing the weather in the foreground; the passing herd of sheep; the dog craving attention from the barefoot chap who is clearly in need of proper orthotic arch support for his feet—please contact me (oz_jim@printsandprinciples.com) and I will send you a PayPal invoice to make the payment easy. 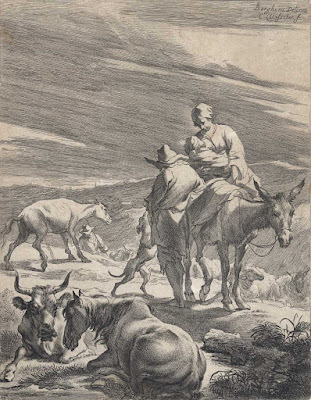 Understandably, Nicolaes Berchem’s designs were very popular with 17th century reproductive printmakers as his images arguably captured the “true” spirit of rural life. After all, I suspect that even today viewers might be surprised and perhaps shocked to see a horse fully engrossed in its act of urinating as shown here. 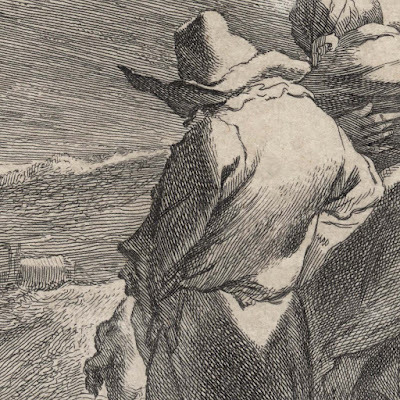 Although Berchem’s vision of rural life in the Netherlands was widely copied, not many of the graphic translations were as fine as this print. 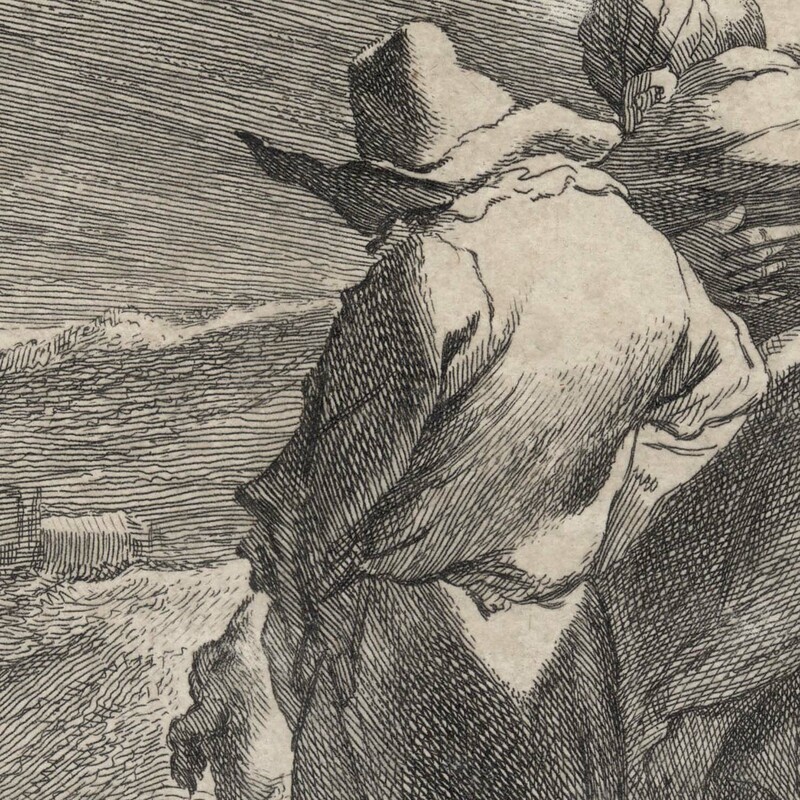 Note for instance the way that Visscher uses VERY closely aligned strokes in his rendering of the sky to suggest a grey wash of watercolour. This is an amazing work of a supreme craftsman. Indeed, even at the time that Visscher executed this masterwork, his prints sold for approximately twice the price of his noteworthy peers like Dancker Danckets (1634–1666) (see Pieter Biesboer (ed.) 2006, “Nicolaes Berchem: In the Light of Italy“, (exh. cat.) 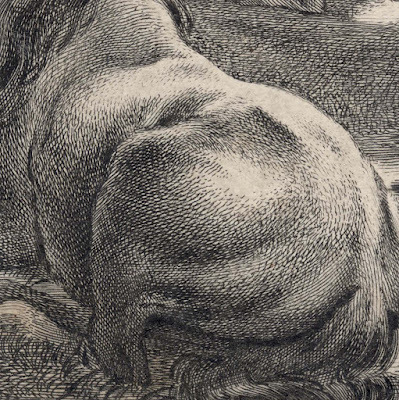 Frans Hals Museum, Haarlem, p. 130).